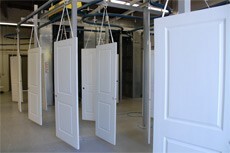 Interior Door Replacement Company is in the business of supplying more than just a painted door. The look and feel of our finished doors will amaze you, and their durability will withstand the busiest of households. Each door is meticulously hand sanded multiple times, in order to create a perfectly smooth sub-base. This is an essential step that others often skip over to save time, but we understand its importance in creating the best possible result. Our sanding process is performed with progressively finer grits. The end result is a smooth surface that is ready to accept the undercoating. The door is then hung on slow moving conveyor system were it starts its journey to perfection. 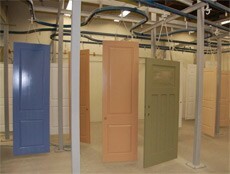 The door moves into a temperature-controlled dust-free finishing booth where the first of several sealers are applied. We understand that a good undercoating is essential to producing a flawless pristine painted surface. Without it, any rough patches or unevenness in the underlying surface would show through the final paint surface. Before the door leaves the controlled painting booth, we apply a final top coat comprised of our specially formulated odorless water base lacquer. We use an advanced spray system that applies paint without leaving any brush or roller marks. The resulting finish gives our doors a perfect balance of beauty and durability. Custom colors and color matching are also available. If you would like to match another color from a different manufacturer or finish, you will need to have your paint matched at Kelly Moore of Mountain View. For further instructions on how to do so, please talk to our sales representative. IDRC cannot be responsible for color matching; you are responsible for verifying the color match and authorizing use of the custom color.